Home » Decorating Resources -- Also note those subcategories in the orange navigation, above! » accessories » And the winner is…: Femme1 and her eyebrow stencils! And the winner is…: Femme1 and her eyebrow stencils! The first winner of our 1st annual Useless but Wonderful contest is: Femme1 and her vintage eyebrow stencils! The brow stencil I found in a thrift shop, and for 25 cents, I couldn’t resist. 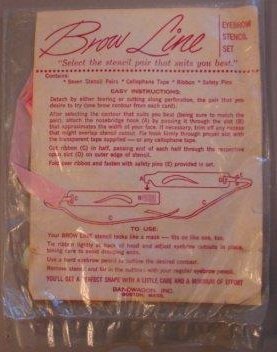 I love the two little safety pins included to pin the stencils on the pink ribbon, and the name of the company–BandWagon, Inc. So why did the eyebrow stencils win: Probably because all of us women know how ridiculous the whole eyebrow thing is. Can you imagine actually using these? 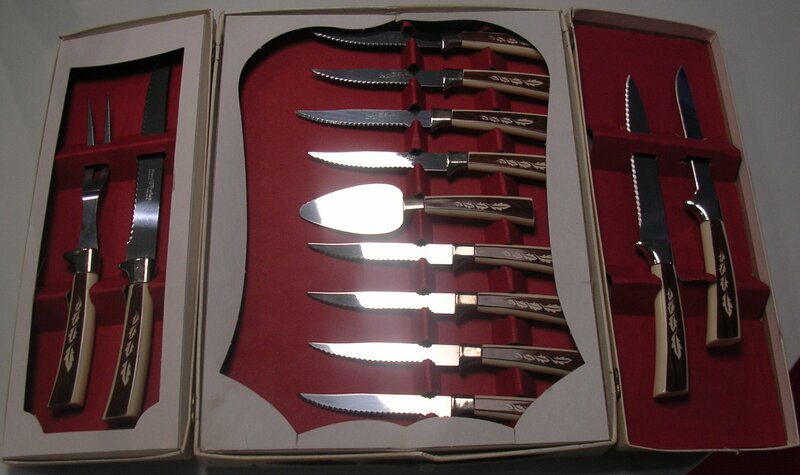 To honor and reward Femme 1 for her tremendous but useless accumulation, she receives from my own personal collection: A set of stainless steel steak knives! Just like in the day! 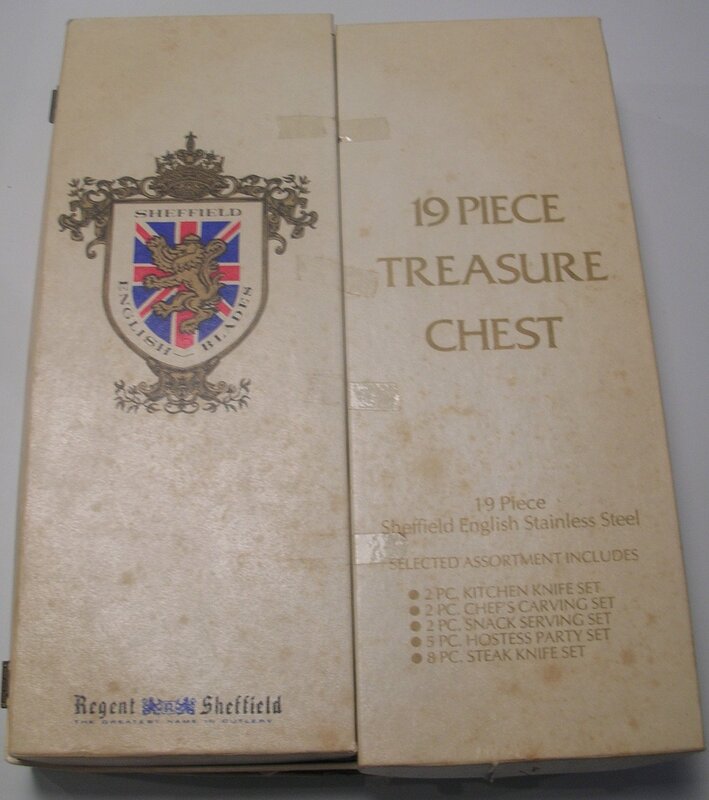 Actually, this is a Regent Sheffield 19-piece Treasure Chest! To give you some background so’s you understand just how precious this is, a friend of my husband’s gave them to us. Seems her husband picked them up at the Stockbridge dump – a famous hunting ground for treasure hunters. Mint in box even! Honestly, even though they came from the dump, I think they are so cool! And also to celebrate, Femme1, a YouTube clip of two dames with nice eyebrows indeed — Peggy Lee and Dinah Shore, from Dinah’s show circa 1959. Enjoy, Femme 1 — if you can bear to take them out of the box, which I could not. Such is the problem with MIB. And… many thanks to all our entrants! Keep your eyes peeled, everyone, for useless but wonderful finds all year long. We’ll have another contest #2 in December! I’m….I’m….speechless! Let me take out my notes. OK OK, I’ll stop. But really. I NEVER win anything. I can’t believe Pam is sending me this incredible set of knives. But perhaps my eyebrow stencils aren’t really as useless as you think. I recently became aware of the new interest in eyebrow shaping. Apparently Oprah has been raving about her eyebrow stylist, Anastasia of Beverly Hills, and how important eyebrows really are. So on her website, Anastasia now offers…what?…EYEBROW STENCILS. I forgot the most important thing: thanks to Pam for all the incredible effort she puts into this blog, and the readers and contributors to RR, for not only voting for my entry, but for helping to make this great blog an interesting place to visit every day.